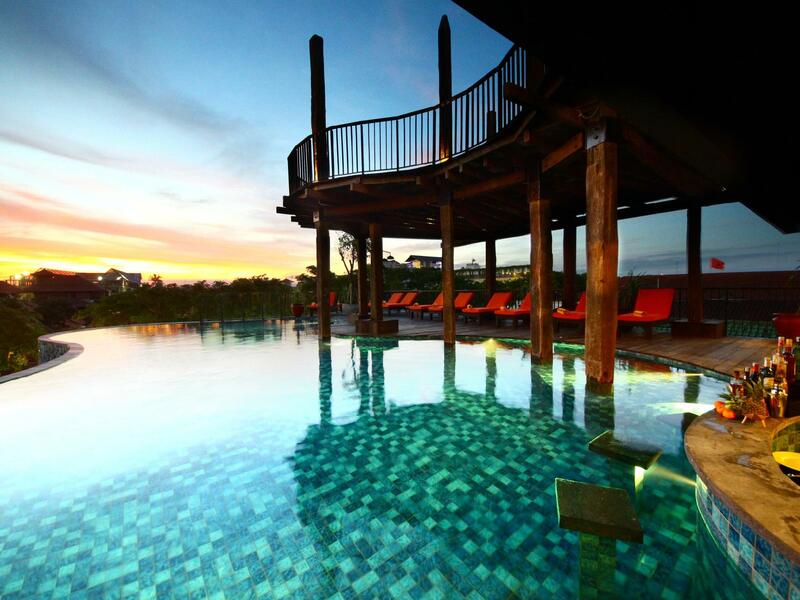 Имате въпрос към Sun Island Hotel & Spa Legian? 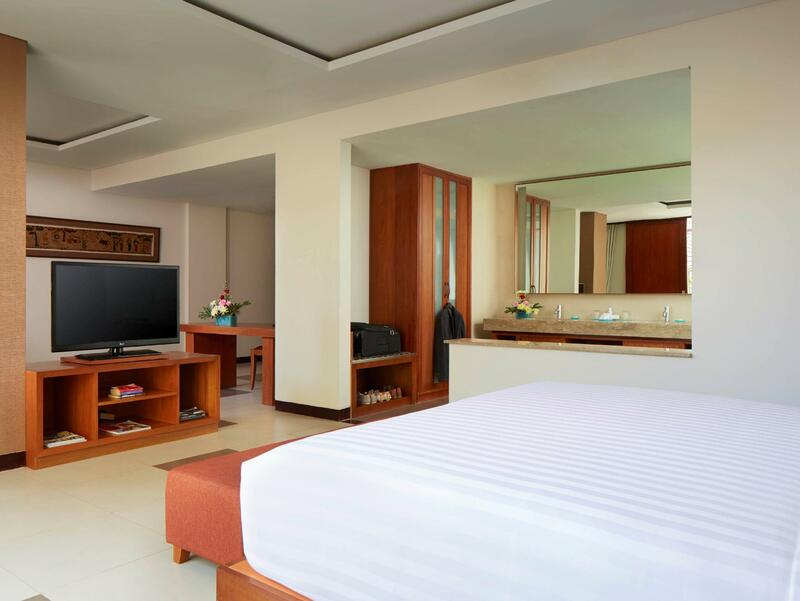 Sun Island Hotel Legian, който се намира в Legian, Бали, е популярно място за туристи. Хотелът не е далеч от центъра на града - намира се само на 4.5 km от него, а до летището се стига за около 15 минути. С удобното си местоположение хотелът предлага лесен достъп до всички градски забележителности, които задължително трябва да се видят. Sun Island Hotel Legian предлага безупречно обслужване и необходимите удобства, за да удовлетвори гостите си. Хотелът осигурява 24-часов рум-сервиз, безплатен WiFi достъп във всички стаи, 24-часова охрана, ежедневно почистване, камина, за да гарантира комфорта на своите гости. Гостите на хотела могат да изберат една от 107 стаи, в които се усеща атмосферата на спокойствие и хармония. Възможностите за отдих, които хотелът предлага са открит басейн, спа, масаж, които също предоставят бягство от ежедневието и предразполагат за пълна почивка. Каквито и да са поводите за Вашето пътуване,Sun Island Hotel Legian е най-доброто място за престой, което можете да изберете в Бали. Everything was pretty good until we tried to sleep. There’s no soundproofing. Besides being able to hear all the traffic, we heard every word of every conversation of drunken men staying here and every door opening and closing. Couldn’t sleep at all and staff did very little to keep them quiet even after we called. 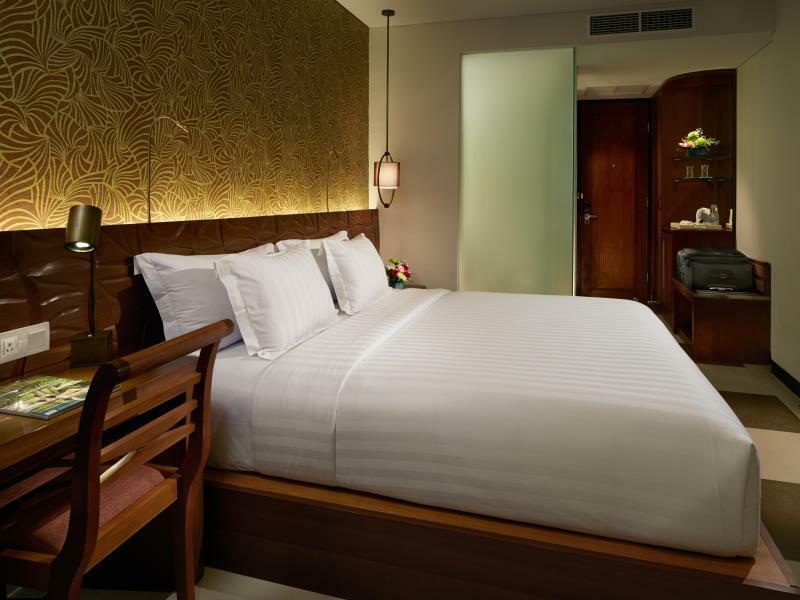 Slmost everytime choice this Hotel when i visit in Bali , cause the hotel is low price and ofcourse you can walking around or just chilling in many cafe or resto near Sun Island Hotel & Spa Legian. So recommend for you guys ! Location was great - close to all shops and restaurants and convenience stores. Pool was nice good size and the rooms very clean. The breakfast on the overhand was disappointing - while a lot of variety and presentation was good, the quality of food was not - bland, tasteless or overcooked, or old (stale bread). Arrived late so booked a close hotel that looked decent. For price, it’s good. Don’t expect super clean. Breakfast was okay. Not much of choice. One down, no ac at lobby and restaurant. Overall, only good for one night. Отседнахме 10 вечер/и в януари 2019 г. The hotel was a good combination of everything in terms of location & facilities. The staff was very helpful and the room was clean. The location was good. We did have a room that overlooked a road and another house. It was very loud at times throughout the night. Overall good stay. Great value, smallish rooms but for what you pay they honestly were great, clean facilities a little aged, but again cheap rooms in a great spot. Would recommend for the younger travellers who understand staying on the strip can be noisy- pool was clean and cool but the decking was a little tired. Breakfast was varied each day but good for what you pay. Fifth stay at the Sun Island, love this hotel. Friendly, in a great spot, great value for money. Very highly recommended. Thank you again Sun Island Management and staff, can't wait for my next trip. Loved my stay here was very clean pool was great with swim up bar and always had fresh towels. Staff were wonderful and both check-in and check out were fast and efficient. Room was clean and tidy absolutely loved the bed it was so comfortable and huge I wish I could take it home with me :) Food was average breakfast was good not great. Only downfall for me was the price of the laundry costs which cost nearly the same amount as 5 days accommodation. Apart from that everything was wonderful excellent location close to bars and clubs and restaurants. I will definitely come back to this hotel. I would like to express my special thanks to the lady (can't remember her name) that checked me in that night. My daughter was overwhelmed with the 2 cute teddies from the hotel after we got back from dinner on second night. Just stayed here for the afternoon while we were waiting for our flight. Nice, clean, cheap place to stay for a few hours. Отседнахме 8 вечер/и в ноември 2018 г. Excellent location if your keen on the nightlife nearby. The pool is disappointing, not very exciting and a pain to get to being on the third floor. The breakfast was very average. We had to move rooms due to no air conditioning in our first room. was nice but probably wouldn't stay here again. The hotel is in the main party street; however, the hotel room was facing to the back and quiet. Some party people occasionally disturbed us, but after reporting to the front desk, everything was sorted out, thank you for that. Breakfast was poor in quality, also at dinner time it was somehow disappointing. Fish and chips and snacks, that you would eat around the pool is good, but we were eating outside. Staff friendly and helpful, the hotel is perfectly clean.